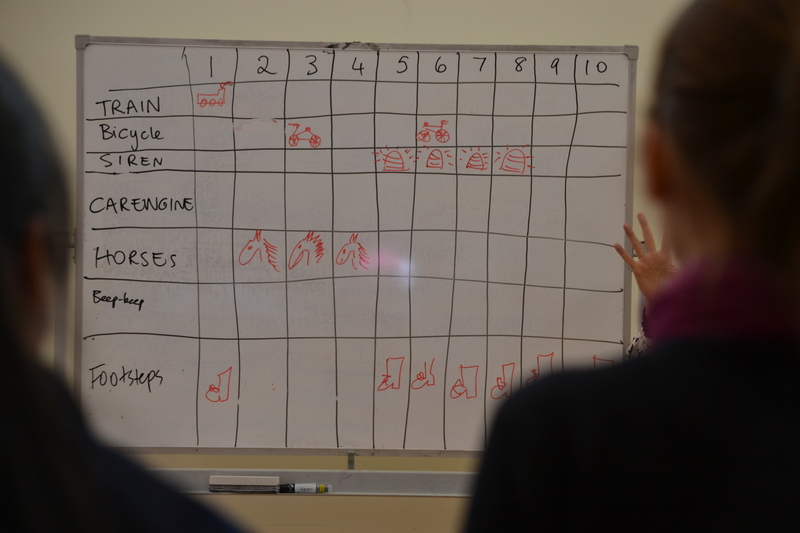 I’ve given five presentations over the last couple of months and many of these have discussed my ideas about teaching music for well-being, rather than simply for excellence. A striving for excellence is in fact part of well-being, so rather than being alternative approaches, a focus on well-being is simply a broader, more inclusive understanding of education. The first presentation I gave, right before I left Melbourne for five weeks in Singapore, Bosnia-Herzegovina, and Brisbane, was as guest speaker for the Scotch College Music Auxiliary Annual Luncheon. Scotch College is one of Melbourne’s most privileged private boys school, with a superb track record of training young musicians, and with some of the best resources and infrastructure (eg. a state-of-the-art, purpose-built music school) for music in the country. I was asked to speak about my music work with refugee children and in post-conflict countries – environments that are typically very poorly resourced in comparison to the Scotch College facilities! These are the notes from that talk, with some of the videos I played to illustrate my ideas. I note here the huge influence that music therapy researcher Even Rudd’s ideas on qualities of well-being supported by music participation have had on my thinking. They have allowed me to condense what for me have been quite broad, detailed, and endless ideas of music’s beneficial impact under four neat headings. We are all here because we believe music is important. The reasons why we think music is important might be very varied across this group –because beliefs about what music is and why it matters are usually culturally-constructed, informed by the environments we have grown up in and our life experiences thus far. I believe music is important because of what it can to contribute to human well-being. I see music as an important part of human flourishing, and that everyone has the right to engage in musical participation and development, and to express themselves freely in music. Music is an essential and universal part of being human. It’s not just for the talented! 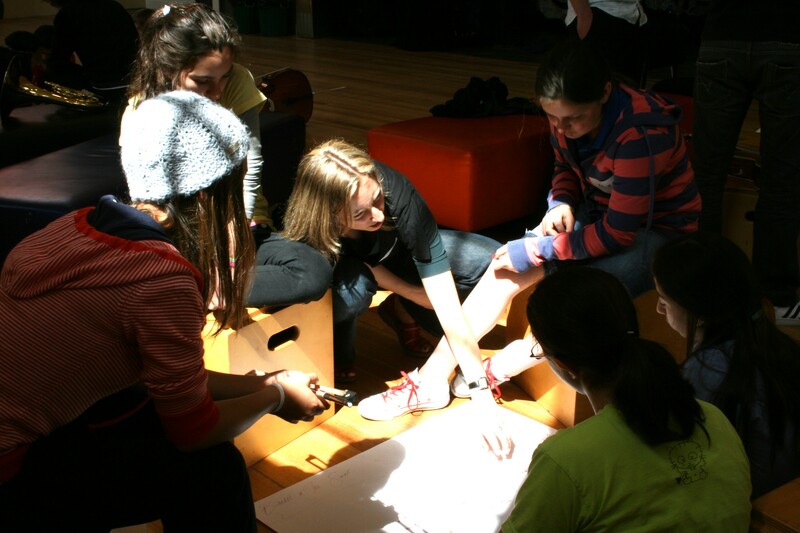 My work as a music leader, educator, and facilitator is about drawing people together to make music, and I do this is all sorts of contexts using improvisation, composition and other creative approaches – with symphony orchestras, with arts centres and community centres and music academies that want to engage with communities in creative and participatory ways and build flexible musicianship among their professional musicians. What I want to talk about today is the experiences I have had in working to bring people together through music who have been through some of the most extreme human experiences. I’m talking about children and young people who have been through experiences of war and conflict, and how music participation can support them to increase their sense of wellbeing in body and in mind. Bonding and belonging – music brings people together in order to play, and the act of sharing music together can create experiences of social connection that can be very enduring. Music participation can therefore increase experiences of social connectedness, and create social networks. Vitality and pleasure – music makes people feel happy and relaxed, in their bodies and their emotions. Playing music allows people to ‘lose themselves’ in a state of flow, where time passes without them really noticing. People forget their worries. Dopamine fires up, oxytocin is released, and the body is flooded with feel-good hormones. Agency – this is to do with a sense of oneself as valuable, as having the capacity to contribute and develop, having a voice and being able influence others even in small ways. The idea of mastery and excellence is contained within this quality of agency – the sense of achievement and therefore pride that can come through developing new skills and learning to do something difficult that takes time, patience and focus. It also includes a sense of recognition and visibility – important when many of life’s choices have been taken away from you. Meaning and hope – this quality refers to the sense of identity, empowerment and transcendence that can come through participating in music. The meaning of the music experience has resonance and relevance beyond the musical act itself. Committing oneself to learning new skills, and the investment of time and focus that learning an instrument or being in an ensemble requires is a hopeful act. The act of hoping is a health-promoting process in itself. In “Musicking” (1998) Christopher Small talks about the act of making music as a kind of ritual in which we enact a version of the world as we want it to be. 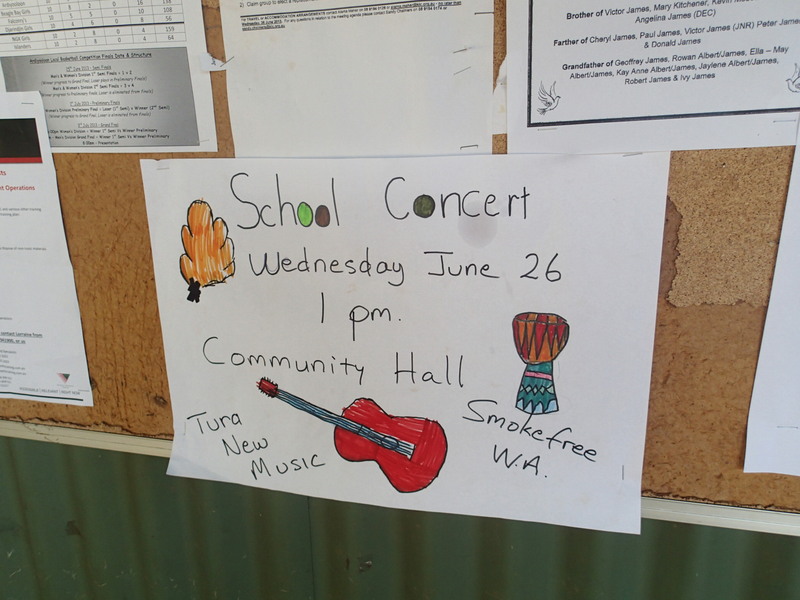 There are three main places I’m going to talking about – post-war Bosnia-Herzegovina, where I worked in 1998 as a musician in a large community music therapy and education centre; in Melbourne with newly-arrived refugee children; and in rural Timor-Leste. When I worked in schools and kindergartens in post-war Bosnia, children were extremely traumatised. They had experienced many deprivations and traumatic events, had trouble sleeping, maintaining concentration, with temper, and anxiety. Music in such a fragile situation is a very secure, friendly, self-regulating activity. People participate if they choose and at the level that is comfortable for them. 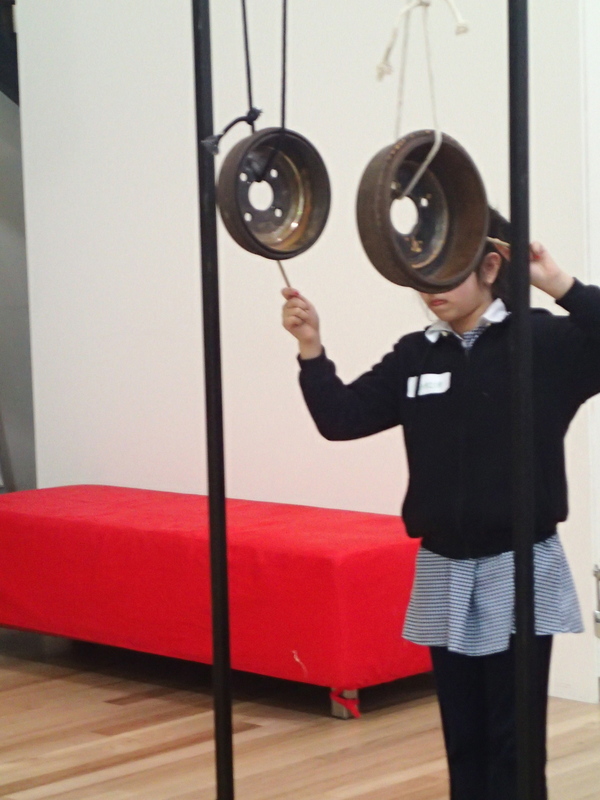 We learned to recognise all kinds of levels of participation – from heads down, eyes shut, to extremely hyperactive participation. 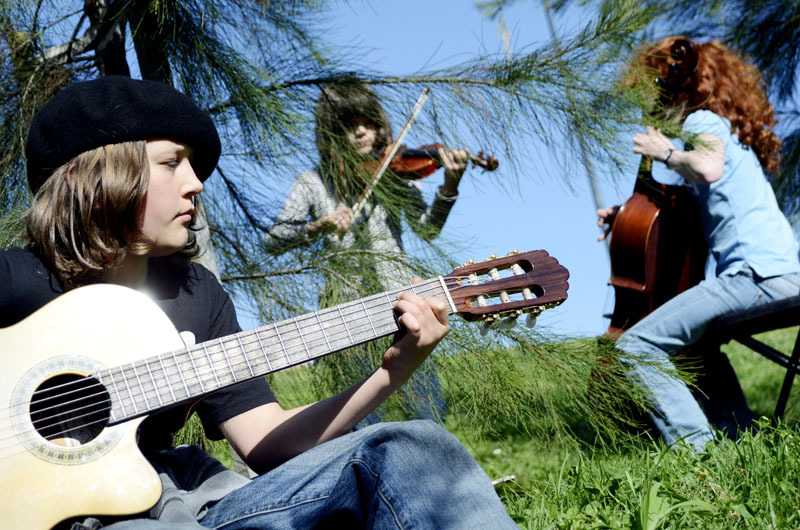 Shared group music-making could bring those extremes together into safer, healthier expressions, through emotional entrainment, and energetic or rhythmic entrainment. Music helped children to feel a little safer, more relaxed, and less on alert. 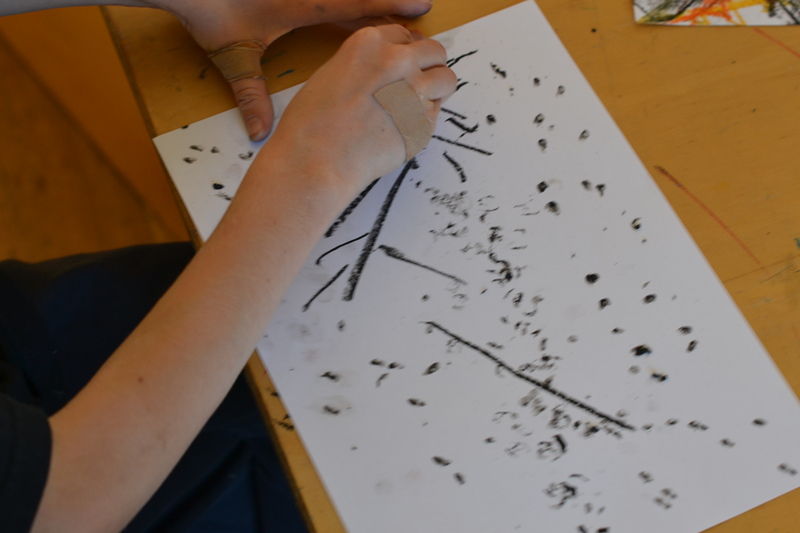 When I returned to Australia, I began working as an artist-in-residence with English Language Schools in Melbourne, which have quite high intakes of refugees and humanitarian entrants. These are schools for new arrivals, and support them to learn English and prepare for classroom learning in mainstream schools. Many of the children arriving in Australia from refugee backgrounds had had little or no access to schooling. They had finely honed survival skills but had very little experience in manage themselves in a classroom or group learning situation. Their experiences had taught them to be very self-focused, to be alert to opportunities, and to push others out of the way if necessary, in order to not miss out. Skills like taking turns, or making lines, or not fighting to solve problems, need to be learned, as do looking at the teacher, focusing attention for longer periods of time, and listening. Music can help with all of these skills, as well as with establishing and reinforcing language and important vocabulary. The opportunity to play music created lots of excitement and happiness. 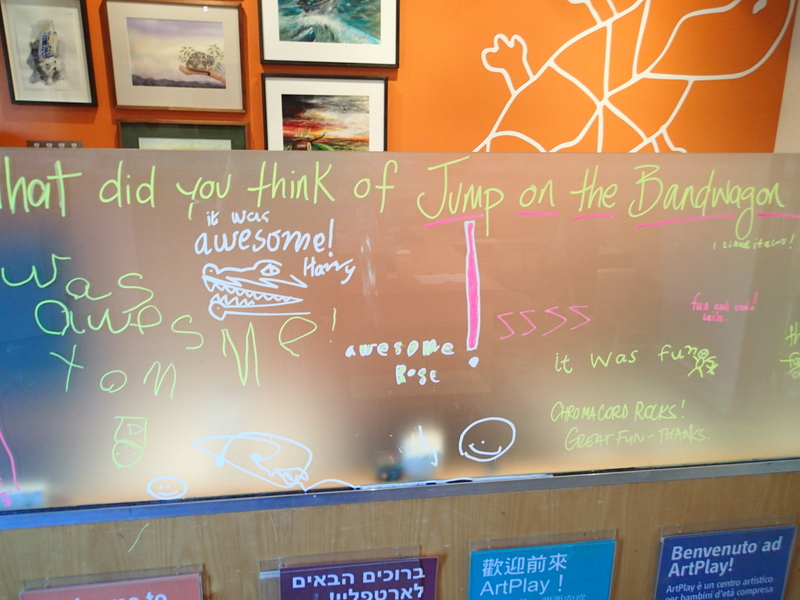 No matter how little English a child knew, they could participate meaningfully in music, because it is not language-dependent. They can participate by looking and listening, and copying what they see others do. 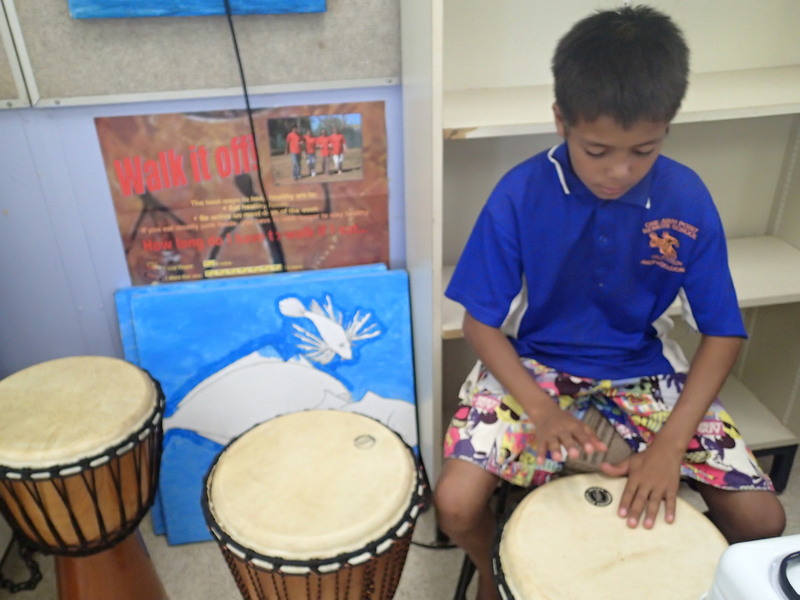 Children who struggled in academic subjects like developing literacy would often shine in music, often because they had been exposed to lots of music in their communities. Playing music was the motivation for learning to work as a team. 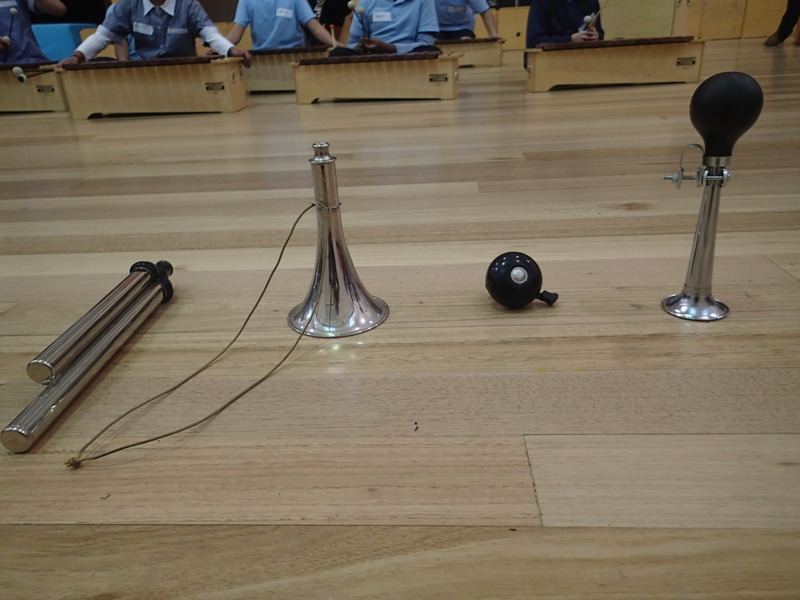 In music the children discovered the intense joy and satisfaction of making sounds in a simultaneous way. 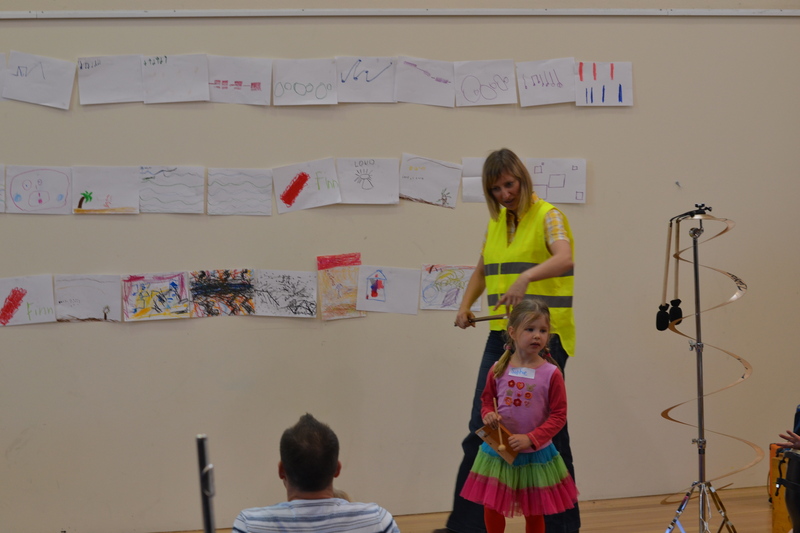 I would construct the composition work slowly over many weeks, using strategies that got children creating all their musical ideas and then weaving these into a larger structure. Hearing the music take shape in this structure was the motivation to take turns, or listen carefully. And without effort, they would find themselves concentrating for long periods of time. 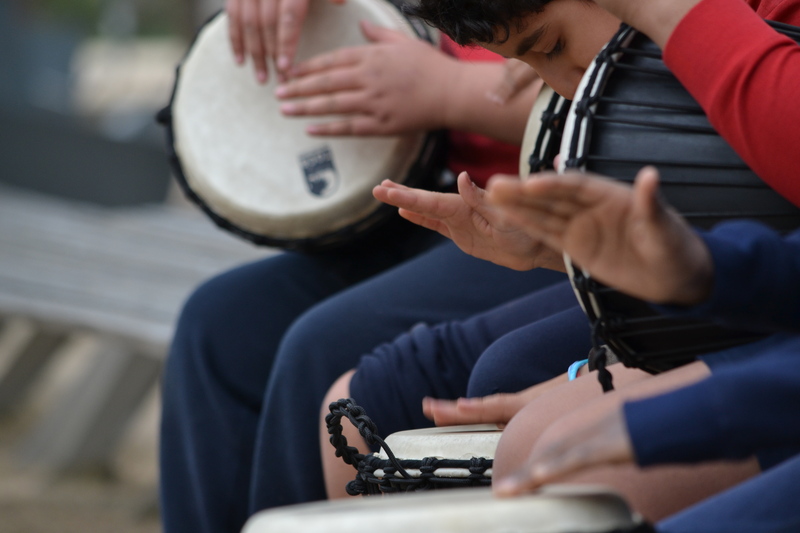 Most importantly, music made the children feel happy and relaxed. Class teachers often reported seeing a new student smile for the first time in the school when they were in a music session. 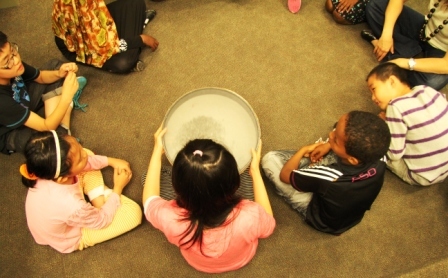 Creative music workshops were also social experiences – I use lots of games and playful tasks to get the children to experiment and take creative risks, so there would be lots of laughing and interaction. 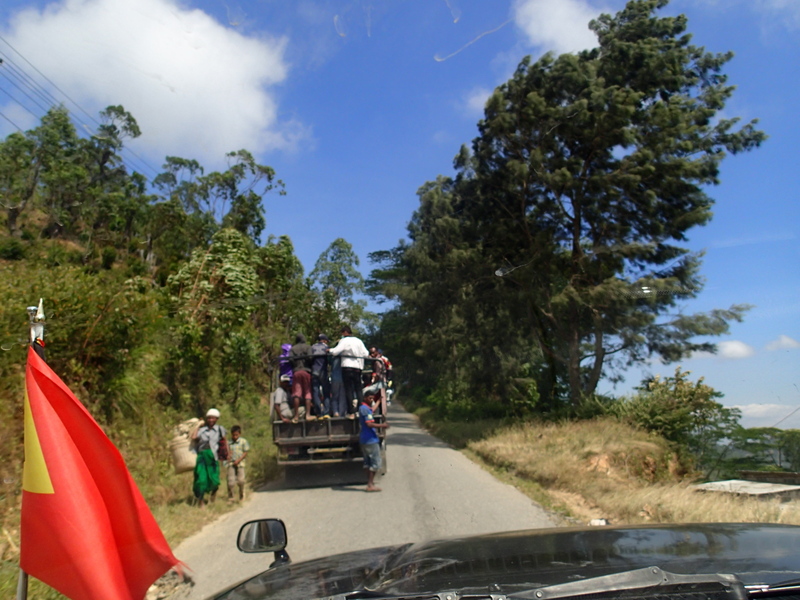 In 2010 and 2011 I had the opportunity to return to a post-conflict country to work as a musician – I was invited to spend four months as a visiting artist in a rural town in Timor-Leste. I developed a program of community music projects that evolved very organically, on the veranda of the house I was renting. 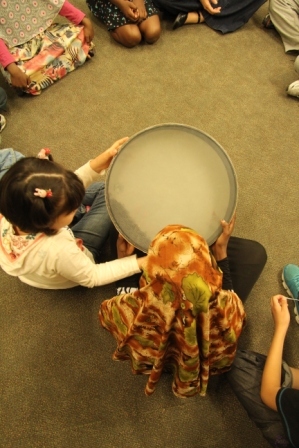 We made instruments out of local materials and according to traditional design, and over the weeks we learned how to play together and connect with each other through music. This video shows one of the short projects that I led there, in the last week of my residency. These clips come from a series of consecutive days, and lead to a live performance on local radio. You can see the sense of agency, mastery, vitality, bonding, and personal meaning that is taking place here. This year I’ve embarked on the next stage of my journey in exploring the relationships between children and music in conflict-affected society. 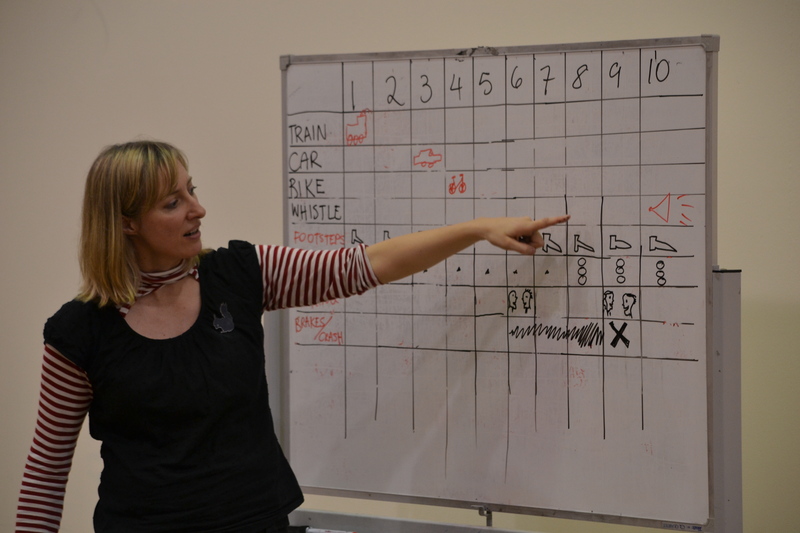 I’ve started PhD research into post-conflict music interventions – schools like the one I worked with in Bosnia that were set up as part of post-conflict recovery. Next week I fly back to Bosnia to interview former participants of the music projects I worked on. They are young adults now. Next year I will similar research in Timor-Leste, and in Afghanistan, where an amazing institution of music has been inaugurated. Finally, I urge everyone here to remember the importance of music to each of us – not just for a well-rounded education, or the mental discipline that may stand us in good stead for future challenges, but because it contributes so deeply to the wellbeing of all people, and can play a profound role in the journey back to wellness for people who’ve gone through major traumatic life experiences. 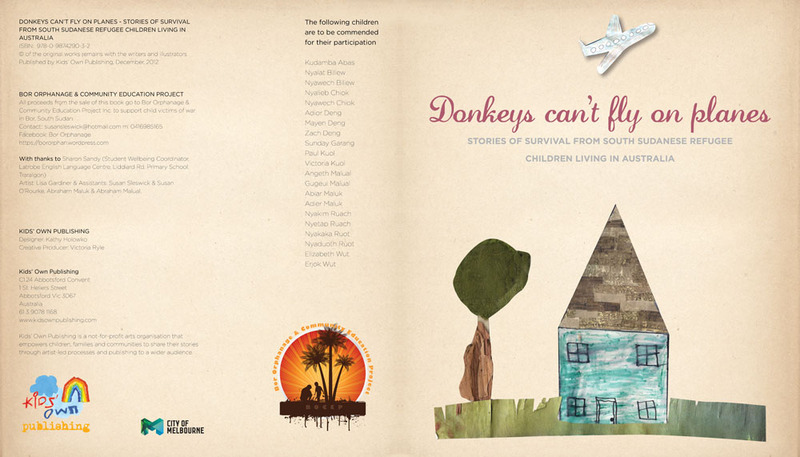 I went to a book launch on Tuesday night for a beautiful book – Donkeys Can’t Fly on Planes: Stories of survival from South Sudanese refugee children living in Australia. This is such a memorable book, filled with powerful, very moving stories written by children about their experiences. Some of the stories describe life before they come to Australia, living in villages with their families, or in large refugee camps like Kakuma, in Kenya. The stories offer us a child’s view of the world there, with snakes that follow you, scorpions that bite, and giraffes that push you over on to the hard ground (“because there is not much grass in Africa”), as well as the story of Steven, the kind and helpful donkey that was a much-loved and valued member of Sunday Garang’s family until they moved to Australia. I loved the story of Nyawech Ruach. She describes herself as having been “an angry girl” who used to fight with other people a lot. She would hit and slap people until they cried, boys and girls alike. She was clearly a force to be reckoned with. One day her brother came to her with a knife in his hand. He wanted to remove her lower teeth (a custom for people from her tribe). But she kicked and screamed until he gave up. Then, when she came to Australia, she went to see the dentist, and the dentist was very happy that she had been such a tough, fierce-some little girl, because it meant she still had all her teeth! (A funny postscript to this story is that on the night of the launch, her teacher revealed that Nyawech is actually an incredibly quiet, shy girl, and everyone was completely amazed when they read her story, struggling to believe it could be the same girl). There are heartbreaking descriptions of hunger and starvation (“I could not cry because I did not have the energy to make the crying sound or to squeeze tears from my eyes”), and of feeling sad and empty when there was no food. But one child also writes about a day when there was a big feast, and the girls got to eat before the boys (“I remember that day well because there was plenty of food for everyone”). Other children write about the journey to Australia, including travelling first by horse, before finally getting to the aeroplane. One boy describes how he didn’t want to go to Australia, so he climbed a big tree and refused to come down. He didn’t want to leave his home, his friends and family, the place where he was born where he knows the language and the ways. Someone had to climb the tree in order to get him down. 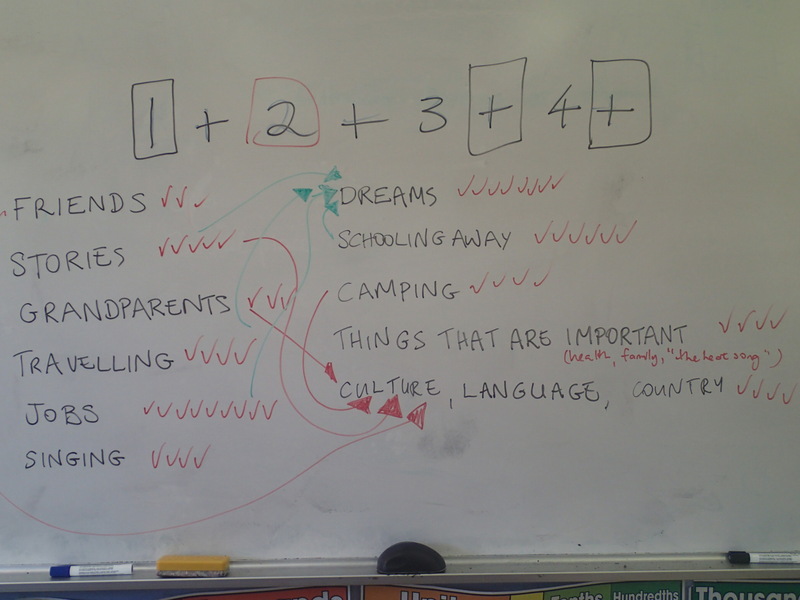 Some of the children write about danger. They write about terrible things they witnessed or experienced in very matter-of-fact ways. Sometimes, the danger in the story comes completely out of the blue – much as it would have done in the child’s life. One day, life was normal… and then all of a sudden it was very, very dangerous and people had to flee as fast as possible. This is a book of stories that need to be told, as the publisher, Victoria Ryle from Kids Own Publishing, said in her welcoming speech. In a political climate that hides the human desperation, loss, trauma, grief and hope of the refugee experience behind numbers, fear-mongering, “business models”, and slogans, the stories offer an alternative image. They also demonstrate just how much refugees can contribute to the communities that welcome them, and how filled with potential they are. A perfect example is given at the end of the book, when we learn that proceeds from the sale of this book will go towards building a school in the village of Bor. 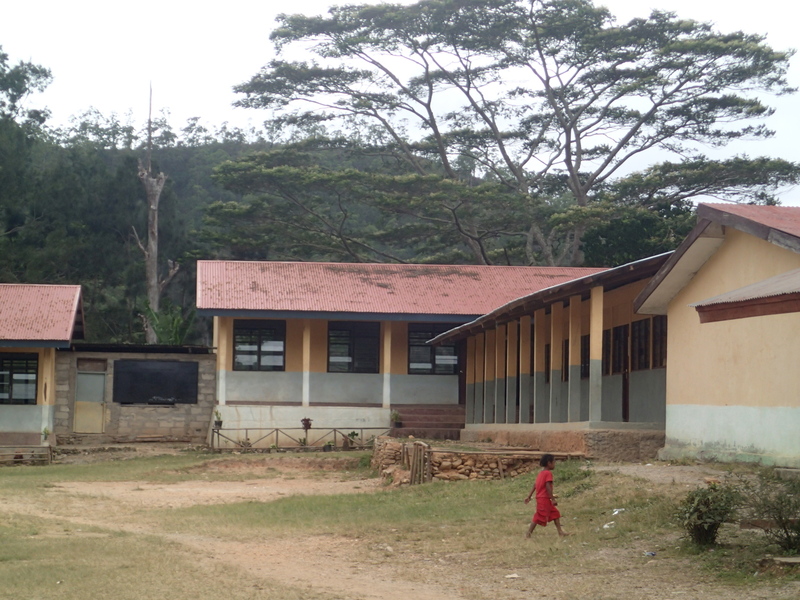 The Bor Orphanage and Community Education Project has been started by two amazing young men. They are former Lost Boys of Sudan and child soldiers who were fortunate enough to be resettled in Australia. Now they want to give back to their community, and have initiated the BOCEP organisation and school/orphanage project in response to the huge number of orphans in their home village of Bor who have no adults to look after them and who are fending for themselves, older children trying to teach the younger children. This is a book for everyone, of all ages. If you are a teacher, please consider buying Donkeys Can’t Fly on Planes for your students to read. There are many possible activities that could be drawn from this book of stories. 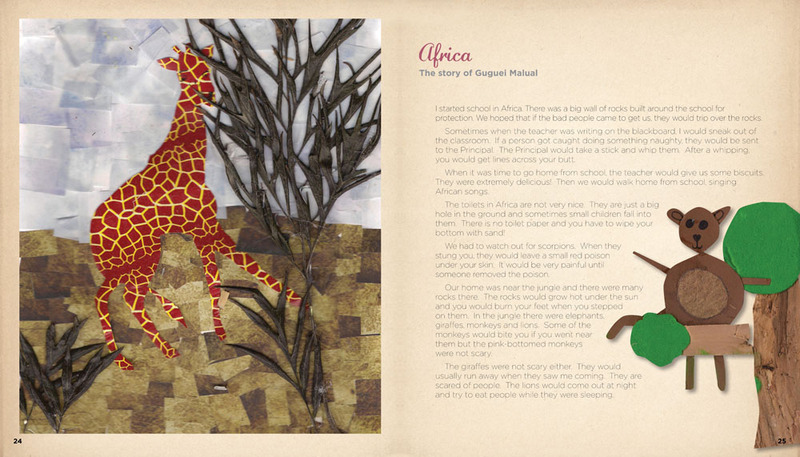 I haven’t mentioned the artwork yet – but the collages that illustrate the stories are also very captivating and will inspire other children to create artworks using similar techniques. You can order your copies directly from BOCEP, http://bocep.org.au/. Lastly, I bought an extra copy of Donkeys Can’t Fly on Planes to give to one of my blog readers. If you would like me to send it to you, please post a comment below this blog post, telling me how you will share the stories with others. I will then contact you directly to get your mailing address, and it will be yours!